After years of downward dogs and sun salutations, it’s time to retire your very first yoga mat. That bright baby blue just isn’t doing the trick, and you need an upgrade. But no need to throw that old mat away, give it a good wash and get ready to get crafty. As it turns out, yoga mats are ridiculously versatile for repurposing, from flip flops to laptop covers to keychains to koozies! 1. 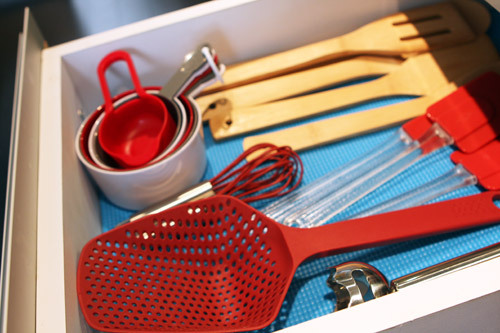 Drawer Liner: Keep those pesky cooking tools, utensils, and knives in check! Simply measure your drawer, and cut to size. 2. 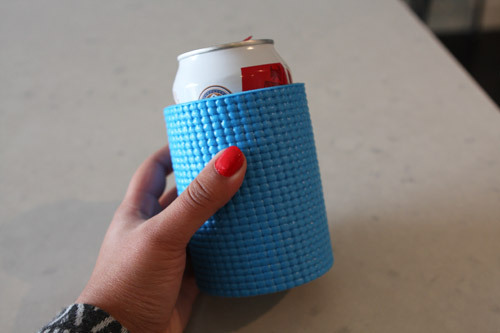 Beer Koozie: Just in time for the super bowl! Cut a piece of yoga mat about 10″ wide by 4″ high. Measure against your can and trim as needed (the variance depends on the thickness of your yoga mat). Glue to the two ends together. Let dry. Cut a small strip to attach to the bottom (so the can doesn’t fall out), glue, and voila! 3. 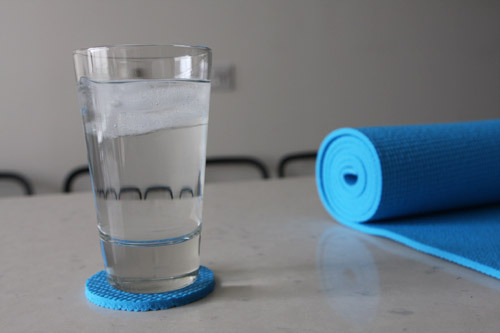 Coaster: Perfect for absorbing the perspiration of an ice-cold glass of water. Cut to a size that works for your glasses and you’re done. 4. Seat Cushion: Add some extra comfort to your dining chairs. We recommend using paper bags to create a templates, trace onto the yoga mat using a colored pencil, and cut! 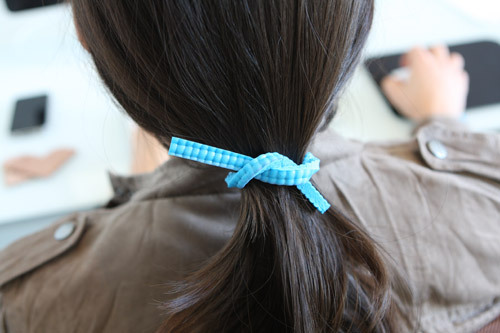 If you want to attach, punch a hole on each side and use string, shoelaces, or ribbon. 5. Jar Opener: This was made out of pure necessity here at Brit HQ. 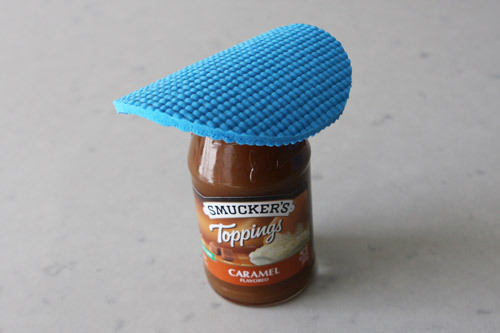 We couldn’t get the darned Smucker’s Caramel Topping open and grabbed the closest thing around, which happened to be a yoga mat. Those grips are still good for somethin’! 6. 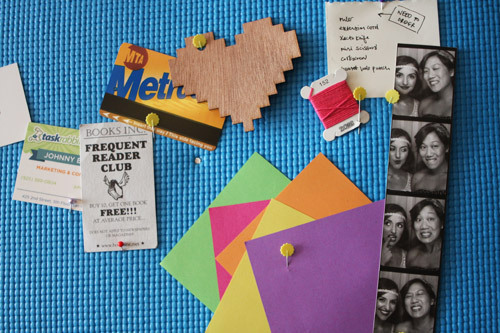 Straight Pin Bulletin Board: Nail to the wall and use a piece of your yoga mat as a bulletin board. Push pins won’t quite work, but sewing pins (or straight pins) are just right. We hammered a nail into the center as well as the sides to keep it flat against the wall. 7. 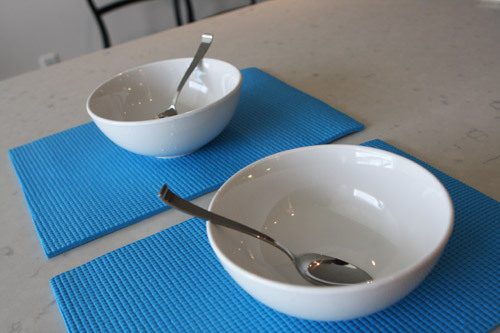 Placemats: Cut into rectangles, circles or squares, and you’re good! If you want to add a little pizzazz, grab a needle and some colorful embroidery floss and stitch around the edges and/or stitch designs onto the place mat. 8. 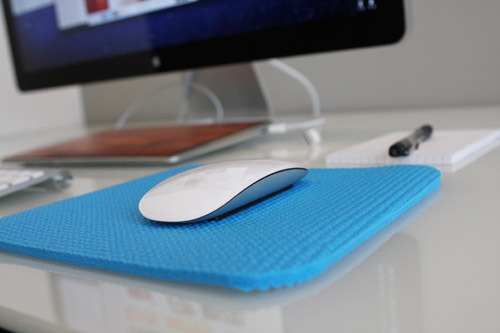 Laptop Case: Use your laptop and measure about 1.5″ around on the yoga mat. Cut two identical pieces and attach on three sides using hot glue. Let set, and you’re done. 9. 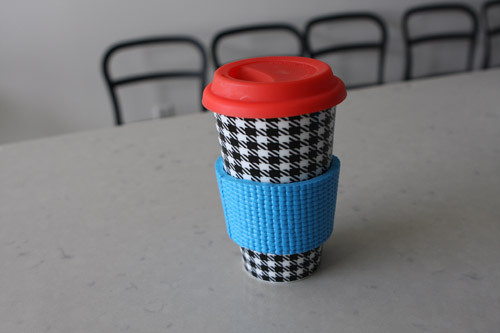 Coffee Koozie: Similar to the beer koozie, this is a smaller version for all those morning beverages. Next time you get a paper one, save it to make a template. 10. 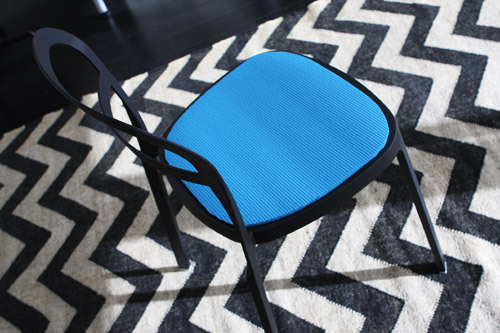 Floor Protectors / Scratch Pads: Beautiful hardwood floors, meet metal chairs. Eek! 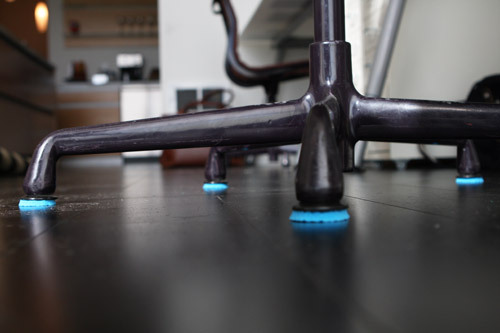 Save your floors from scratches by cutting out small circles from your yoga mat and attaching them to the bottom. If you’re looking for a permanent fix, use super glue. For something more temporary, go for hot glue. 11. 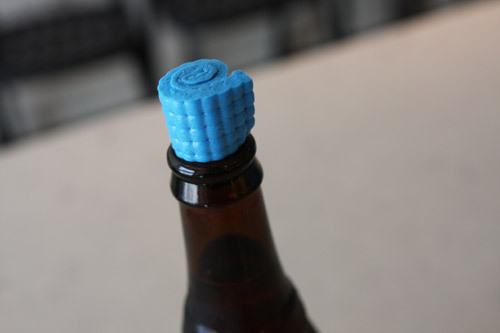 Beverage Stopper: Lost the cork to your latest bottle of cab? Or perhaps you legitimately want to save half your beer for later? 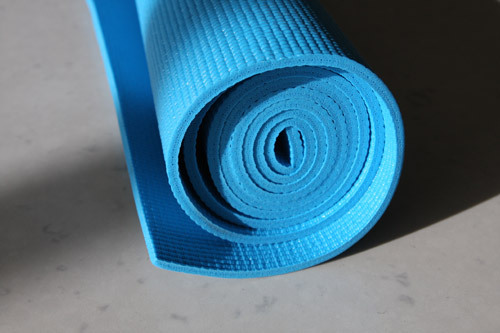 Cut a piece of yoga mat about 4″ wide by 2″ tall (depending on your mat), spread glue on one side, roll it up, and boom! 12. Mouse Pad: Cut to size, round the corners, and there you have it. Your wrist will thank you. 13. Padded Gift Envelope: Similar to our Neon Duct Tape Envelopes, you simply cut two identical pieces, glue on three sides, hole punch and tie with string. If you want to mail something like this, replace the string with packing tape! 14. 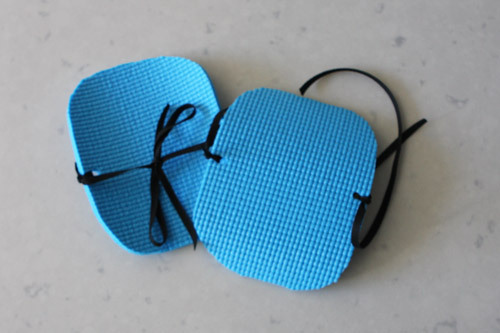 Knee Pads: For days in the garden or scrubbing a stubborn tub, these knee pads will make chores oodles more comfortable. 15. 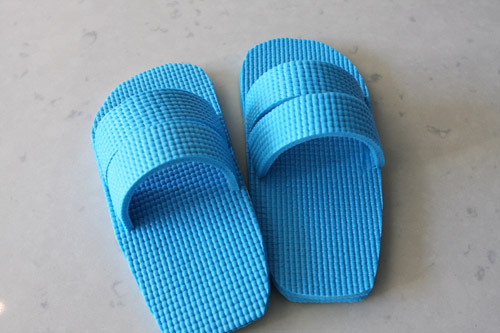 Flip Flops: More of a house slipper take on the flip flop, these may just have you striking into impromptu yoga poses around the kitchen. Simply trace your foot, cut about 1″ around, then attach straps using hot glue or super glue. We used two layers of yoga mat glued together for the soles. 16. Hair Tie: Trying to take your yoga love to the next level? Impress fellow yoga-goers with a fashionable hair tie made from none other than your old yoga mat! 17. Buoyant Key Chain: Heading out for a sail on the bay? Or perhaps a tropical beach vacation? 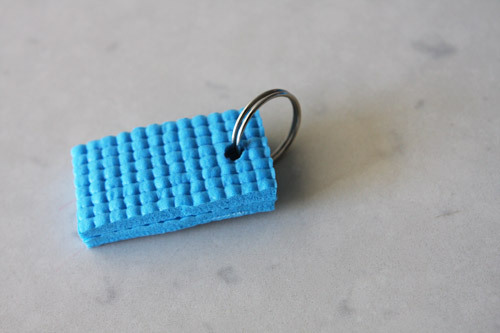 Make sure your keys stay afloat with this easy buoyant keychain. Cut two pieces about 2″ wide by 1″ high, hole punch in the same place, and attach to a keyring. 18. 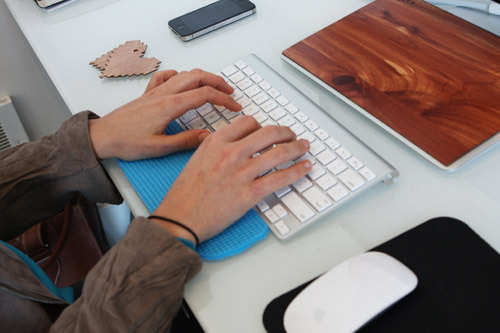 Wrist Pad: Typing the day away? Protect your wrists with a little yoga action. And if you’re using a laptop, cut two and keep them in your laptop case. 19. 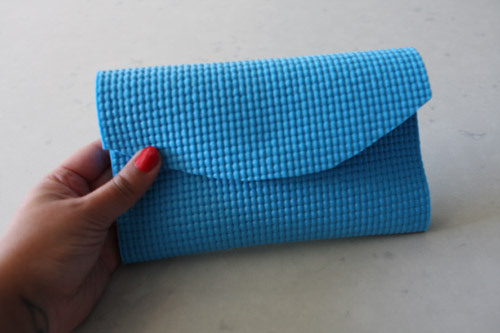 Clutch: You already knew that yoga was fashionable, but who knew you could accessorize with a yoga mat? Cut a large rectangle with a rounded top. Fold into a style you like, and measure where you want your snap buttons to be. Attach the snap buttons using super glue. Then glue the bottom part of the clutch (everything but the fold-over) on two sides using super glue. Ta-dah! 20. 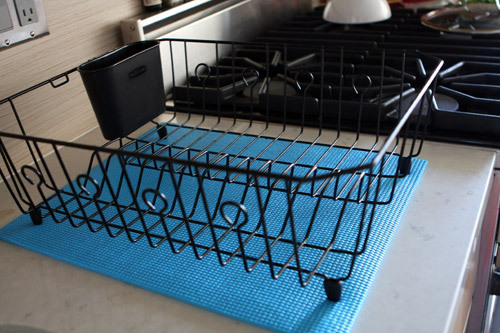 Drying Tray: Drying racks are super useful, but what about all that water that seeps onto your counter after you’ve washed a load of pots and pans? Your yoga mat can absorb that, and is easy to wash after a few rounds under the rack. And there you have it. 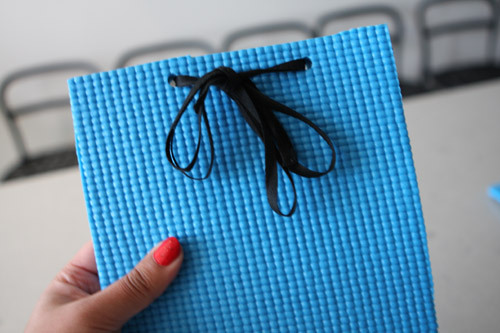 20 simple ways to repurpose your old yoga mats! 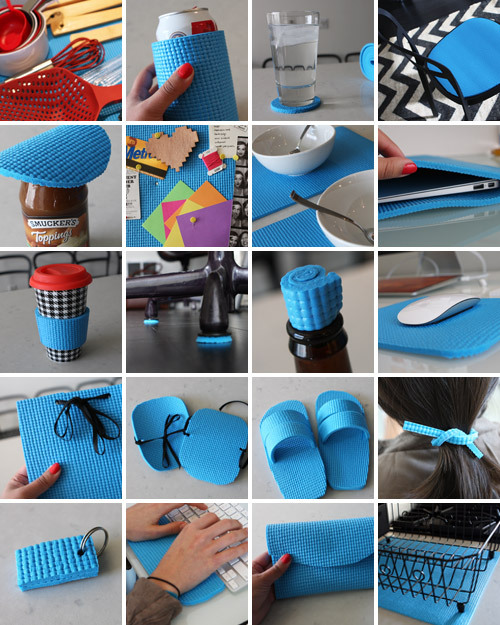 If you have a rubber mat, additional repurposing projects could be oven mitts, pot holders, flat-iron holders for travel, etc. The possibilities are pretty endless with this material so get creative! How do you repurpose old exercise gear? I would love to hear your ideas!